Grand Traverse Roofing provides residential roofing materials and roofing type for the Traverse City roofing industry. On average, a home's roof must be replaced, or at least repaired, every decade. Grand Traverse Roofing guarantees much longer lasting roofing material but we felt it was pertinent to give you the average in the Traverse City roofing industry. Traverse City metal roofing specialist. Metal roofing essentially consists of sheeting using galvanized steel (i.e., metal tiles or pieces). If you are looking for a lightweight, durable, portable, biodegradable, energy efficient, flexible, and element (fire, wind) resistant Traverse City roofing alloy look no further. 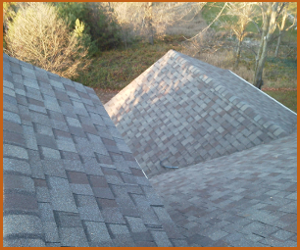 Shingle roofing is very popular in the Traverse City area. Roofing shingles consist of sheet materials that overlap one another individually. The customer has a choice between an amalgamation of different minerals and materials including composites, fibreglass, wood, and ceramics. Grand Traverse Roofing recommends fibreglass shingles over paper and wood based shingles because they are less of a fire hazard. 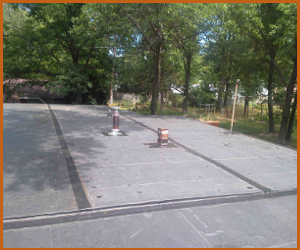 Flat roofing consists of horizontal sheathing or insulation. This is in stark contrast to a veranda-esque arrangement such as a shingle roof and is more commonly used in commercial applications.Flat roofing is not recommended for colder climates, as flat Traverse City roofing materials-such as gravel-are not impermeable to aqueous solutions, such as ice. Grand Traverse Roofing is also a certified roof repair specialist. If your roof requires repair due to environmental damage or age; we can have a new roof on your Traverse City area home in record time. Grand Traverse Roofing also provides Traverse City roofing repair services if you simply want to repair your damaged roof instead of replacing it altogether. We believe there are several reasons why roofs eventually need to be repaired, but there are certain environmental factors in particular that can accelerate the erosion process. For instance, we believe that the number one cause of roofing damage is lack of maintenance. An initial kink or problem that is ignored can rapidly spread across the roof. Moreover, Grand Traverse Roofing is well aware of the damage that Mother Nature can inflict on a roof. Continuous weathering via rain, hail, ice and wind will have an eventual toll on even the sturdiest of roofs. However, improper assembly and poor roofing design choices can also exacerbate roofing problems exponentially. For instance, improper or incompatible use of Traverse City roofing materials can cause significant problems. Furthermore, the improper assembly or implementation of said roofing materials (i.e., frail roof structure that causes sagging) can also cause significant roofing damage. Fortunately, we strive to provide the best roofing repair service in the Traverse City area. Our roofers are dedicated, innovative, experienced, and educated and have a passion for all things roofing. They take great pride in the happiness and comfort that their roofing services provide for our Traverse City roofing clients. 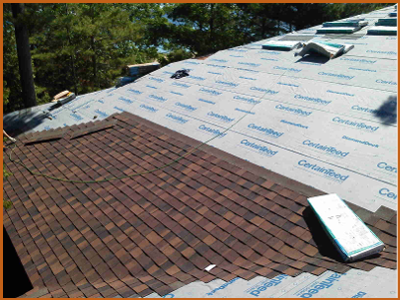 Moreover, Grand Traverse Roofing provides several roofing services at very affordable rates. We also provide emergency repair services as well as scheduled repairs that work at your convenience. In addition, Grand Traverse Roofing believes that haste equals waste. We will always consult you on the materials, costs, and estimated repair time before any repairs are initiated. Grand Traverse Roofing is very flexible and can perform repairs on sloped or flat roofs, including performing asphalt and shingle installation as well as flashing and fascias. Hence, we are dedicated to providing the best possible service quickly-without breaking the bank. This "trifecta" based company philosophy is what drives Grand Traverse Roofing to become the industry leader that we are today. Please contact us today for your Traverse City roofing repair and installation needs and we guarantee we will not leave you disappointed. Metal roofing System: Moreover, Grand Traverse Roofing recommends metal roofing due to its perfect balance between durability and style. Metal roofing is also fire resistant, immune to most elemental forces, and energy efficient. Thus, Grand Traverse Roofing provides a diverse array of industrial and commercial Traverse City roofing solutions. We also provide an exhaustive roof maintenance system to ensure your new roof will be your last. Grand Traverse Roofing ensures that all our roofing products are top-of-the-line, AAA, Traverse City roofing products. However, we are also well aware that eventually roofs will need to undergo some form of maintenance. Fortunately, roofing maintenance is generally very minimal and can be undertaken rather quickly and easily, with no hassles. We strongly believe that a routine roofing maintenance program can increase the life of your roof by up to 100% in the long-term. Moreover, Grand Traverse Roofing consists of a highly trained team of dedicated roofing professionals that can perform a routine maintenance check-up on your industrial or commercial roof to ensure that everything is up to speed. Furthermore, we will work around your schedule to ensure that our inspections are done at a convenient time for you with minimal disruption. In addition, we can provide an annual or bi-annual gutter cleaning. Similar to going to the dentist, annual checkups will ensure that problems are fixed quickly and effectively while they are still small. Grand Traverse Roofing will also ensure that roofing costs are kept to a minimum. While some may claim that annual roofing maintenance programs will cost more in the short term, we can assure you that roofing costs will be 10 times more if negligence leads to roof failure or complete roof collapse due to a small problem that quickly spread across the roof. In effect, a complete roof rehaul is something you want to avoid at all costs due to the time, money, and inconvenience problems it causes. Fortunately, Grand Traverse Roofing has several roofing maintenance program options at your disposal. For instance, we provide a 24/7 emergency roofing maintenance plan for complete peace of mind. We can also provide a fixed-annual, or bi-annual roofing maintenance plan as your needs require. In addition, Grand Traverse Roofing ensures that our roofing maintenance programs are always value conscious, reliable, thorough, effective, and customer driven. In fact, we believe that customer delight breeds customer loyalty and we always place our customers first. Please do not hesitate to contact Grand Traverse Roofing for your Traverse City roofing maintenance program needs.